Breaking Friday: The International Energy Agency said OECD oil stockpiles are almost down to their 5-year average. Why it matters: That's the original goal of the production limiting deal between OPEC, Russia and some other producers seeking to clear the global glut. OECD stocks fell to just 30 million barrels above their 5-year average at the end of February. "With markets expected to tighten, it is possible that when we publish OECD stocks data in the next month or two they will have reached or even fallen below the five-year average target." "It is not for us to declare on behalf of the Vienna agreement countries that it is 'mission accomplished', but if our outlook is accurate, it certainly looks very much like it." But, but, but: The goals and status of the OPEC-Russia relationship have become an evolving thing as the producers continue grappling with the rise of U.S. shale and seek to prop up prices. It's unlikely they'll seek an early exit to the current agreement that's slated to run through year's end. "Despite shrinking oil inventories, Opec producers have said alternative metrics must be considered when evaluating the success of the deal and how long cuts should be maintained," the Financial Times noted Friday. And there are also plans for a longer term — maybe much, much longer term — collaboration on market management. The New Jersey legislature approved bills yesterday that provide $300 million in annual subsidies to keep a pair of nuclear plants open and expand the state's renewable electricity standard. One reason it matters: As we wrote about yesterday, some climate advocates are increasingly worried about the prospect of substantial numbers of economically struggling nuclear plants coming offline in coming years. What's next: Democratic Gov. Phil Murphy is expected to sign the measures, according to multiple reports. They will enable the big power company, Public Service Enterprise Group, to keep the Salem and Hope Creek Nuclear Generating Stations open. More: The New York Times has a detailed story about the bills here. Yes, but: A Thursday evening note from the firm ClearView Energy Partners says that a federal court challenge is "highly likely" if and when the nuclear measure is signed into law. They note cases pending against so-called zero-emissions certificates (ZECs) for nuclear generation in Illinois and New York, but add, "We think New Jersey lawmakers structured its nuclear subsidy with the ZEC lawsuits in mind." 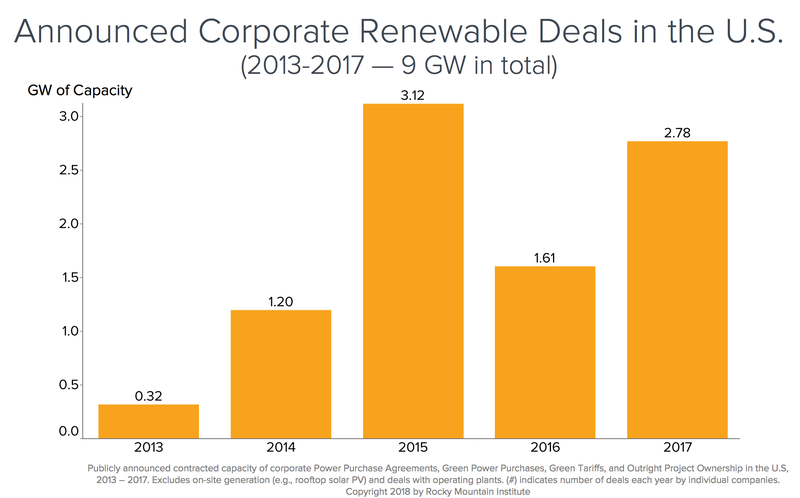 A new report from the Rocky Mountain Institute's Business Renewables Center takes stock of corporate green energy purchase deals in recent years and where things are headed. The chart above shows new renewable deals in the U.S. (but excludes certain categories like on-site rooftop solar). Who's involved: The many companies that have made various types of renewables deals in recent years include PayPal, Goldman Sachs, Starbucks, JP Morgan, Facebook, GM and Ikea. The bottom line: Corporate purchases have emerged as an important driver of new renewable power development, and it's moving well beyond the handful of early pioneers like Google and Apple that defined the market from 2008–2013, the report shows. Shaking up: Bloomberg’s deep look at Volkswagen’s executive shakeup says new CEO Herbert Diess’ progress on electrics will be key. “His term will be judged early on by whether he can scale up his revamp of the VW brand to the entire 12-brand group to prepare for an era of battery-powered self-driving cars,” they report. New (but familiar) face: The Senate voted 53-45 yesterday to confirm lobbyist and former longtime Capitol Hill aide Andrew Wheeler as deputy administrator of EPA, the number two position at the agency. Why it matters: Wheeler — who also worked at EPA under Presidents George H.W. Bush and Bill Clinton — brings the experience of a longtime Beltway hand to the agency in tumult amid the swirl of ethics problems facing Administrator Scott Pruitt. He could also become the agency's head if Pruitt is ousted. Quick take: Wheeler, whose lobbying clients have included coal producer Murray Energy, is unlikely to bring a shift in direction at the agency that is aggressively seeking to unwind Obama-era regulations. Instead, his knowledge of the agency, guiding statutes and regulatory details could help avoid the stumbles that have slowed Pruitt's efforts to rewrite or nullify rules. "Andy brings a lot of experience with the agency and process — he will make the trains run on time (and on the tracks!). While the agenda is set, I expect things to run smoother and more efficiently." "I also would expect he will develop positive relationships with the careers which help things," referring to career EPA staff. Go deeper: The Washington Post has more here. Driving the news: Julio Friedmann, former top official in President Obama’s Energy Department now working on carbon capture technologies, testified to Congress this week at the request of Sen. John Barrasso, Republican chairman of the Environment Committee. Last year, he testified to Congress at the invitation of Sen. Tom Carper, the panel's top Democrat. Our thought bubble: It’s exceedingly rare for an expert to be invited to testify by lawmakers from both parties in such a close time period. One level deeper: Republicans like carbon capture technology because it furthers the development of fossil fuels in a carbon-constrained world. Some more liberal Democrats and climate advocates like it because fossil fuels are so prevalent in society, it’ll be hard to tackle climate change without this type of technology. What’s next: After passing legislation earlier this year expanding a key tax credit for the technology, the same bipartisan group of lawmakers are at it again with a new bill that further supports permitting of such projects, on which Friedmann testified. Our prediction: Congress doesn’t do much actual legislating in an election year other than on essential issues like spending, but if anything has a shot at passing, this would be it. Behind the pro-Pruitt movement: This Bloomberg story has lots of behind-the-scenes info on the campaign by conservative and industry groups that has salvaged — at least for now — Scott Pruitt's job atop the EPA. It explores the efforts of the major GOP donor Doug Deason, who "texted and emailed contacts at the White House to make clear he wanted Pruitt to stay." "As reports surfaced that Trump’s chief of staff had suggested the EPA chief needed to go, Deason got angry. 'If that’s true, I think Kelly needs to go because he has no spine,' he says. 'We need to get on the offense.'" Focus turns to security chief: Per NYT, "A former Secret Service agent, with a background investigating the Gambino crime family, is serving as the chief of security for Scott Pruitt, the administrator of the Environmental Protection Agency, and has helped build an unusual and costly protective apparatus around him." More accusations: Via CNN, "Environmental Protection Agency Administrator Scott Pruitt routinely directed staffers to book expensive hotels, help him earn frequent flier miles and schedule meetings to align with his personal travel desires, a former top staffer told congressional investigators."